Jabari Blash blasted 2 home runs in the 4th inning last night. 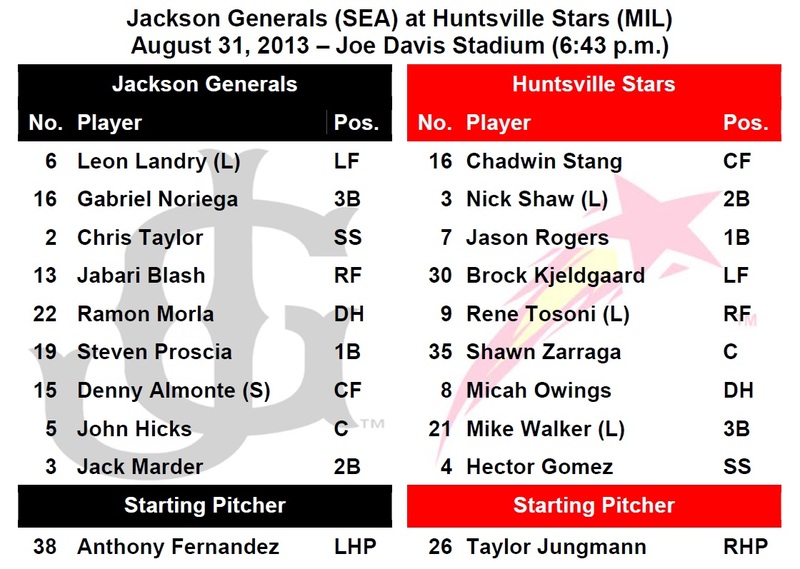 TODAY’S GAME: the Generals, riding a season-best 5-game winning streak continue their final series of the season tonight with the game #3 of a 5-game road series with the Huntsville Stars (2-0)…this season Jackson is 9-6 against the Stars and 5-2 at Hank Aaron Stadium…the Generals also close out the month of August tonight and are 16-14 during the month. 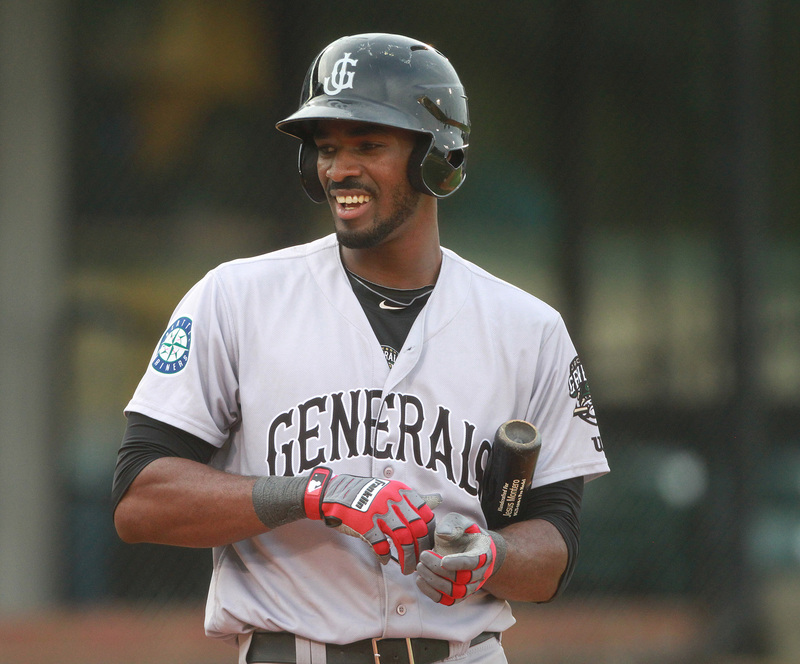 GENERALS RECAP: RF Jabari Blash hit 2 home runs and drove in 5 runs as part of an 8-run 4th inning as Jackson defeated Huntsville 8-5 on Friday night. Blash (2×4, 2 R, 2 HR, 5 RBI) recorded his 3rd multi-home run game of the season (also: 8/15 vs. Montgomery w/JAC & 4/16 vs. Lancaster w/HD) while recording his 24th and 25th home run in 2013 (9 with Jackson). 2B Jack Marder (3×4, R, 2B) recorded the team’s only other multi-hit game, while LF Leon Landry (1×4, R, RBI), C John Hicks (1×4, BB), 3B Ramon Morla (1×5), DH Steven Proscia (1×3, R, BB) and CF Denny Almonte (1×3, R, 2B, RBI, BB) each recorded 1 of the Generals 10 hits. Starter Jimmy Gillheeney (6.1,5,4,3,1,4) recorded his 7th win with Jackson (9th overall), allowing 4 runs (3 ER) on 5 hits in 6.1 innings. LH Kyle Hunter (0.2,1,0,0,0,0) and RH Dominic Leone (2.0,2,1,1,1,0,HR) combined to allow 1 run over the final 2.2 innings in relief. NEWS & NOTES: 47 of 132 games have been 1-run games (20-27) which is the T-1st in the Southern League…67 of 132 games have been decided by 2-or-fewer runs (26-41) and 17 have been extra-inning games (5-12)…In games decided by 3+ runs the Generals are 33-27. • BLASH-T OFF IN DOUBLE-A: OF Jabari Blash has hit safely in 18 of 25 games since being promoted to Jackson, batting .326 (29×89) with 13 runs scored, 3 doubles, 9 home runs, 21 RBI and 19 walks. Blash homered twice in the 4th inning on Friday and has 25 home runs this season leading all of Mariners Minor Leaguers. His 5 RBIs during the 4th inning was the most in a single inning in franchise history. • NO DOG DAYS FOR TAYLOR: INF Chris Taylor is batting .333 (38×114) with 22 runs scored, 5 doubles, 1 triple, 8 RBI, 17 walks and 10 stolen bases in 30 games in August. • BLACK JACK IS BACK: INF Jack Marder currently has a 4-game hit streak, batting (8×15) with 1 run scored, 1 double, 1 RBI, 2 BB and 1 stolen base. • WE GOTCHA!! Jackson catchers lead the SL catching 50.8% of base stealers (66 CS, 130 Att). The next closest is Pensacola which is throwing out 35.0% of base stealers.